My father, uncle, brother and partner are all chiropractors, and I’ve always been interested in health and the way things work. I started out studying engineering and computer science. But I was still reading books about natural health, nutrition and healing and feeling drawn to a more fulfilling career path. A seminar I attended inspired me to change careers and follow in my father’s footsteps to become a part of people’s health journey as a chiropractor. Your body knows how to heal and often only needs a helping hand to guide it. By freeing up your system, the innate wisdom in your body helps you heal. Dr Andrew went from being an engineer and teaching at university to attending chiropractic school in New Zealand. His background in engineering gave him a head start on understanding the way things work. 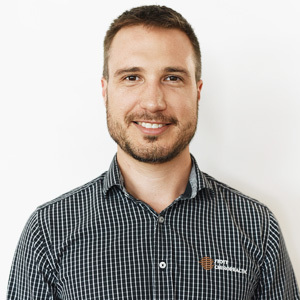 Andrew studied his Chiropractic undergraduate at the New Zealand Collage of Chiropractic, then returned to Sydney and attended Macquarie University to receive a Master’s degree in Chiropractic. Dr Andrew gained the best of both worlds with his education. In New Zealand, his education concentrated on the philosophy of holistic health and wellness. At university in Sydney, he was taught medical, evidence-based chiropractic care, giving him a full understanding of his patients’ state of health. In 2012 Dr Andrew travelled to India and volunteered his chiropractic services and basic healthcare to impoverished people of Siliguri, West Bengal. This experience revealed the amazing potential of chiropractic to him and its effects on people of all ages. In addition, Dr Andrew is qualified as a personal trainer and certified to perform dry needling. Since home exercises and lifestyle advice are an important component of your treatment, we seek to empower you on your path to optimum health. I love seeing the changes in my patients’ health and inspiring them to improve their life. They get excited and come back with more questions and a new desire to maximise their health potential. When he isn’t helping patients at Stott Chiropractic, Dr Andrew likes to spend his time outdoors doing activities such as climbing and hiking. He has two children and enjoys going camping with them. He takes regular education courses to continue learning about nutrition and other important aspects of health. Are you ready to find out how we may improve your function and performance? Contact our practice today!